The Trump White House is just a high-level version of a sleazy pawn shop where the owner traffics in stolen goods. Everybody knows the owner is profiting from crime — including the owner — but as long as as he keeps his fingerprints off the precise moment the goods are stolen, he's allowed to keep making his living off the fruits of other people's wrongdoing. It may not be technically illegal. But it sure isn't right. Please read the whole thing! Man, this is some speechwriting from John Bolton, announcing new sanctions on Cuba. I have expected him to continue: "Who knows what evil lurks within? ONLY THE SHADOW KNOWS!" Mueller preview: Maybe the president is innocent. So why does he keep acting like a thug? There’s a reason so many people think Donald Trump is corrupt: He keeps giving them reason. On Thursday, a redacted version of the Mueller report will be released to the public. Perhaps the president is right: Maybe the document will exonerate him of accusations of colluding with Russia to win the 2016 election, and maybe it will further offer reason to believe that Attorney General William Barr was correct when he decided not to pursue allegations the president obstructed justice by firing then-FBI Director James Comey. But if that is the case, Trump and Barr have done the worst possible job laying the ground for the president’s innocence. Instead, they’ve seemingly done everything possible to make the release of the report look like a cover-up. 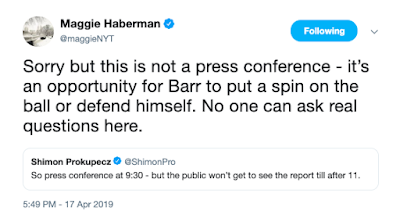 For example: The principles of transparency would usually suggest that the public — or, at least, the media — have a chance to look at the report and begin to digest its findings before Barr holds his press conference. • This is a Bonnie and Clyde movie that, for the most part, is lacking in Bonnie and Clyde: The filmmakers figure you've already seen the classic movie and there's no reason to compete with that. So it's the case that we literally don't see fully the faces of our fugitives until the very last seconds before they're ambushed by Texas lawmen in a hail of bullets. The story concentrates, in this case, on the hunters, played by a laconic Kevin Costner and his sidekick Woody Harrelson, playing Woody Harrelson. FilmStruck is avenged! Long live Criterion Channel! • Since FilmStruck's demise, I've made a concerted effort to build up my DVD collection with classic movies. I'm glad that Criterion is here, but I don't trust streaming services to have many of the movies I want when I want them. Big corporations that own the rights to those movies have already demonstrated that letting the public have access is a lesser concern, profit-wise, than promoting their more recent catalog. So I'm glad to have Criterion to expand and deepen my movie education. But I'm still buying DVDs. End of an era at the Lawrence Journal-World. "Believing women" doesn't mean we have to accept accusations as evidence. So what might it mean in real life? • When a woman makes an accusation, it would mean pursuing all available lines of evidence to weigh the truth of her claims. 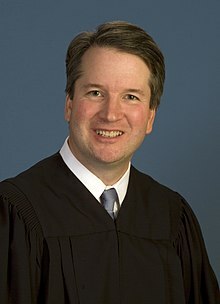 In the matter of Brett Kavanaugh's SCOTUS nomination, it would mean calling Mark Judge, Kavanaugh's buddy, to testify under penalty of perjury. So far that's not happening. That the Senate Judiciary Committee is not taking such a step suggests they don't have much interest in trying, as best as we poor humans are capable, of making a genuine attempt to determine the truth of the matter. • When a woman's accusation is proven, the person convicted of abusing or assaulting her will be given more than a slap-on-the-wrist punishment. • And women a woman says she has been traumatized by sexual assault, we don't wave our hands and tell her to toughen up instead of being such a victim.